It is a time for play and a time for work. It is during this time when plants and flowers are abundantly blooming that I think ahead to the long, barren winter. Why? Because now is the very best time to plan, prepare and create herbal medicines. From teas, salves, elixirs, infusions, and many other ways to heal and care for thyself; now is the time to grow, harvest, dry, preserve and store our precious herbs and flowers. Rose and Bee Balm Oxymel. Oxymels date back to the ancient Greeks and can be used to heal in many different ways. It is a simple yet powerful remedy, literally a mix of honey and vinegar. Most oxymels are infused with herbs to make them more potent. An herbal cough syrup; this sweet and sour elixir can be mixed in hot or cold water, taken by the spoonful, or added to an herbal tea. There are many ways to use this remedy, and it is specific to the respiratory system. It is great for coughs, bronchial ailments, sore throat, mucus, even cold and flu. Each ingredient in this oxymel plays a starring role, and they compliment the work of one another quite well. Honey; the anti-microbial superstar is used to suppresses pathogen growth. It, along with apple cider vinegar, (ACV) soothes dry throats. The ACV is also anti fungal/viral/bacterial and is a great solvent for extracting the healing properties of the herbs. Each ingredient is the preservative, while honey masks some of the flavor of the vinegar. Rose, a garden favorite of many, (especially me), is a truly uplifting flower. It promotes well-being, soothes the nerves, supports a variety of ailments from stress to sore throats, and the hip of the plant provides one of natures most excellent sources of vitamin C. With a lot to love about it, it is a great addition to an oxmel– but an organic addition that is… Rose is commonly sprayed with harmful pesticides and insecticides so make sure you know your source well if you are not using rose from your own garden. (Source safe, organic rose petals here). Oil of Oregano is currently a popular item in alternative medicine for combating candida and various infections, but what most people do not know is that the active constituent of Oil of Oregano is present in large amounts in our own Monarda. For anything you might use Oil of Oregano for, you can substitute the prolific (and cheap) Monarda. As a diaphoretic herb it can support the fever process by increasing internal warmth while someone feels cold and is shivering. Bee balm is a diffusive herb. It brings heat from the core of the body to the periphery. If that sounds abstract to you, try drinking a cup of hot bee balm tea. You can literally feel the heat rise from the core of your body up to the skin and then dissipate. That’s diffusive! plastic mason jar lid or standard jar lid with plastic or wax paper barrier between the liquid and the lid. (Vinegar corrodes the lid making your remedy unusable). **For an extra dose of vitamin C, add rose hips to your oxymel. I buy chopped oneshere. Bee balm can be a bit tricky to find in commerce, so you may use dried thyme, oregano or rosemary for this remedy. Fresh (wilted) herbs can be used in this remedy but you will need double the amount of plant material and will need to store this oxymel in the fridge once it’s made. (If you make your oxymel from dried herbs it will be shelf stable). 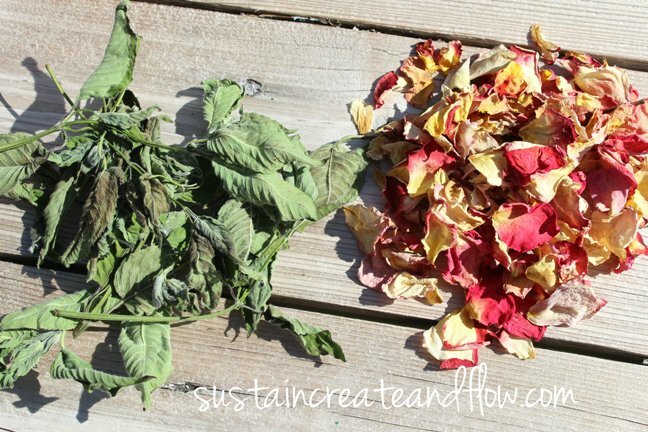 *If you need a great source for rose petal or other dried herbs, check here. 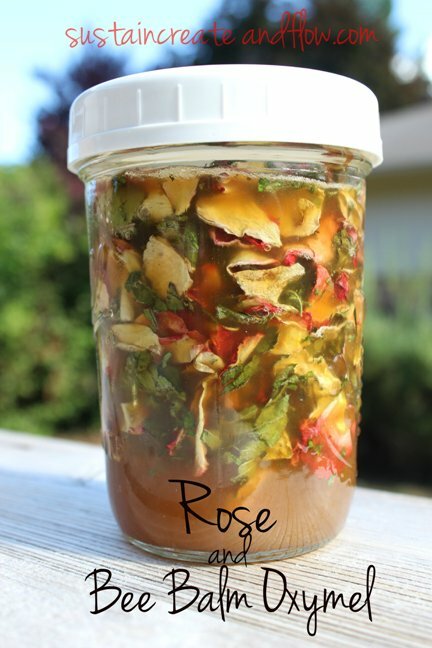 Fill half of your jar with dried rose petals and bee balm, and pour equal parts raw honey and raw apple cider vinegar on top. There is some flexibility here, adding more honey to make it more sweet, or using more vinegar to make it more sour. It’s up to you. I like to make mine half and half and use more honey at the time of use if I find the mixture to be too sour. (Which I hardly ever do) But, for children this is a great trick! Stir to incorporate and then attach your lid and shake well. Once infused, strain out your herbal material and store in a cool dark place. When using dried herbs, your oxymel will keep for a year or more. *Remember, when using fresh herbs, your oxymel needs to be stored in the refrigerator. If you are lucky enough to not fall ill next season, enjoy your sweet and sour elixir as a salad dressing base, a marinade, simmer sauce or other creative culinary concoction. Do you ever make oxymels? 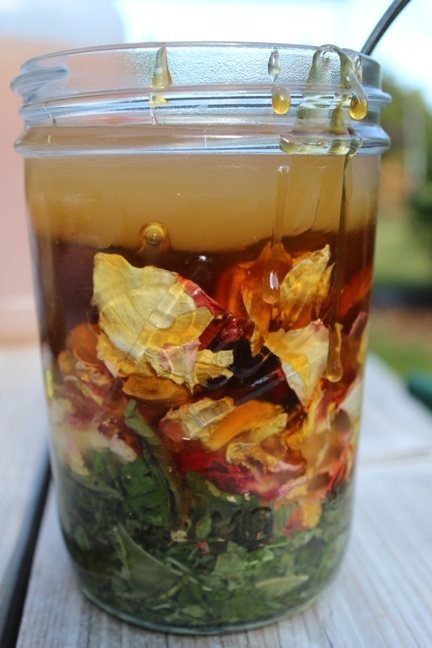 Which herbs do you use to infuse them with? Thanks for posting this. 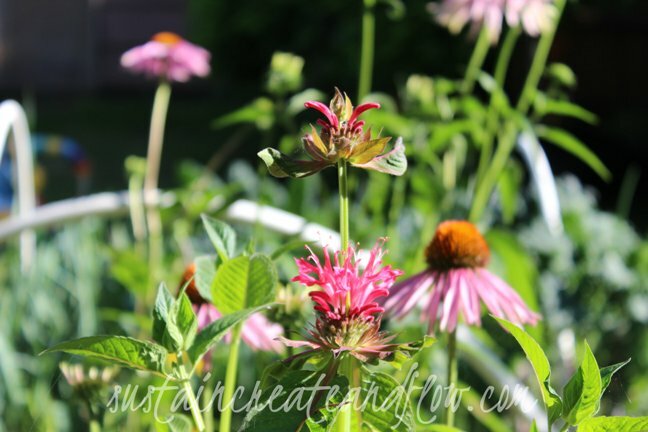 Are you using just the bee balm leaves? 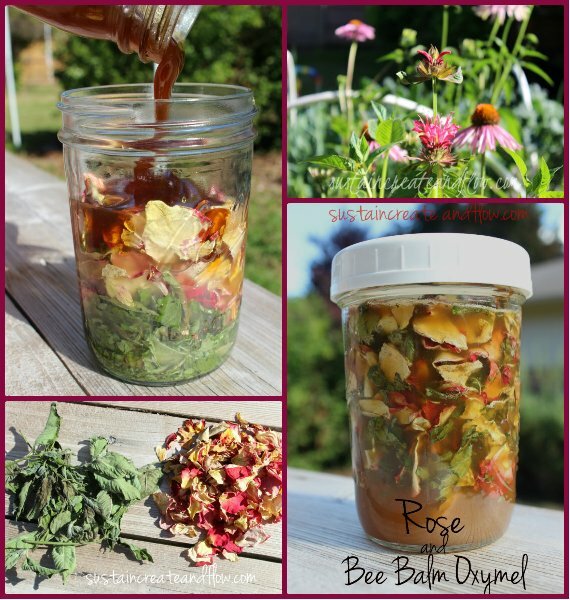 Thanks for posting this, I have a beautiful patch of bee balm and will definitely make this. No pesticides for me. Also have 5 rose bushes and have been drying the leaves and hips. Yay! I’m definitely going to be whipping this up in the next couple of weeks in preparation for the onslaught of fall/winter colds that seem to infiltrate our home. Thanks for sharing on Wildcrafting Wednesdays (and hosting)! I hope you’ll join us again and share many more of your awesome posts in the future. I’m so glad you could join us as well! Thanks so much for this post. I’d love to make this with dried herbs, in a large amount, to give as gifts. So, thinking about it proportionally and not so much dependent on the jar it’s in, the recipe would be 1 part honey, one part vinegar – and then how much dried herb (let’s say thyme or rosemary) would I use? Thanks in advance for any info! !